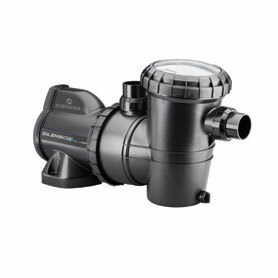 Your pool pump is the heart of your swimming pool. It takes water from the pool, filters and sanitizes it, and sends the clean water back into the pool where your family enjoys a lazy Saturday afternoon. Choose a pump efficient enough you don’t have to run it only during off-peak hours and enjoy the convenient swimming pool lifestyle you want. Single speed motors. | Two speed motors. | Variable speed motors. The most efficient are variable speed and although more expensive upfront, they save hundreds of dollars annually in energy costs (the Hayward 2.7 EcoStar VS can save up to 90% of your pump-related energy costs). Single speed pumps have a low purchase price, but cost the most to operate. Two speed pumps offer the best balance of cost vs. performance for most families. Variable speed pumps are Energy Star certified (affordable to run), but more expensive upfront. An old pool pump can cost your family hundreds of dollars in wasted energy every summer. Visit our showroom to see your options and upgrade to something that will help your family spend more time in the pool without spending more to keep it clean.